SmartCode Hyper-V Server Manager allows an administrator to view, manage and establish remote desktop connections to virtual machines hosted on a Hyper-V host. To Start/Stop/Pause/Save/Restore/Reset a VM, select the desired VMs and either use the context menu or the main toolbar. The Hyper-V Server Manager supports several methods to establish a remote desktop connection to the virtual machine. 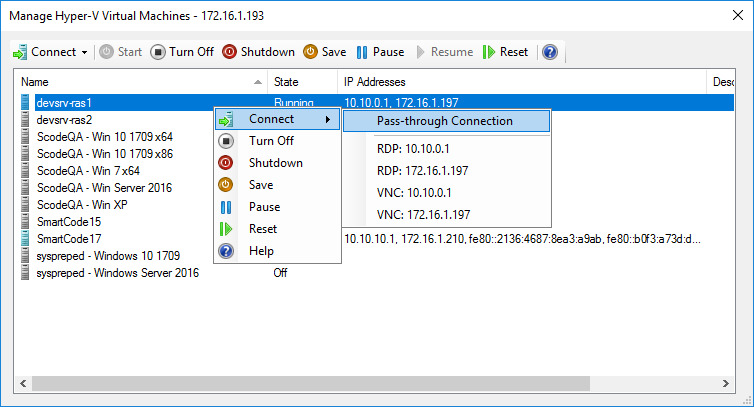 The SmartCode Hyper-V Server Manager allows you to open a RDP or VNC connection to a VM if it has Integration services installed and has either one or multiple virtual Ethernet adapters configured.